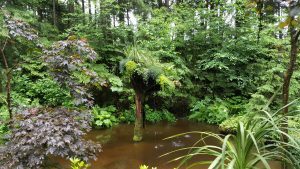 Glacier Gardens Rainforest Adventure offers an informative glimpse into a small section of the largest temperate rainforest in the world. 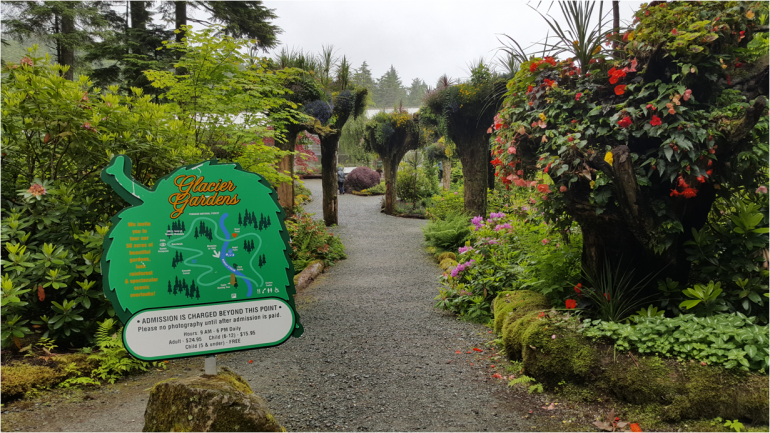 The tour begins in the lovely lower gardens and ascends 900 vertical feet up the mountain to an amazing view of the airport and Gastineau Channel. Upon arrival, adventurers walk through the lower gardens surrounded by their lovely flower towers. Proceed to the Visitors Center to sign up and pay for your tour. 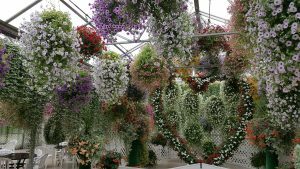 You will encounter an amazing venue with hundreds of hanging petunias and hanging vines. 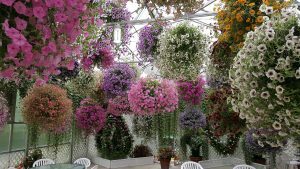 Over the Café and Gift Shop areas the greenhouse you will enjoy a ceiling whimsically decorated with scores of decorative umbrellas. The effect is stunning and forms a lovely setting for special occasions. The tour meets back in the garden. 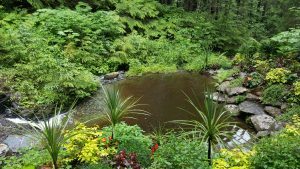 There the guide will explain how the present owner, a plant nursery owner, took over a property devastated by a landslide in order to expand his greenhouse space. 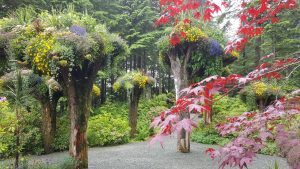 As he used heavy equipment to clear the space, an accident as he attempted to remove a fallen tree resulted in his inspiration to create the flower towers. See the website for more information: http://www.glaciergardens.com/. The tour moves to the upper end of the garden for the guided cart tour up the mountain. 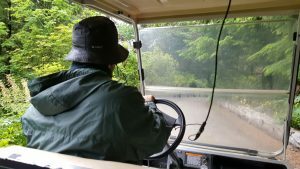 As the cart crawls up the steep road, he points out how the stream was diverted into cascading pools to stabilize the landscape as well as facts regarding the construction of the road. Additionally, he offers various botanical insights on the local trees and plants. 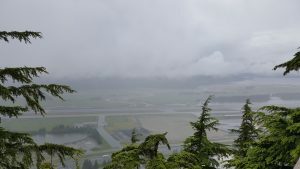 Finally, at the top of the road, you can get out and walk along a trail to an overlook offering an amazing view of the valley below and Gastineau Channel. One of the cascading pools. On the plus side, the tour was informative and the scenery was truly beautiful. However, a drawback is that the tour was overpriced at $25 per person. Glacier Gardens could improve the adventure by adding a hiking trail to the property for visitors to continue to explore a beautiful piece of property.